There is a common career path for the top orchestral musician: National Youth Orchestra, perhaps a specialist music school, prizes at competitions, a place at one of the top music colleges (or Oxford or Cambridge), lessons with a big-name teacher, occasionally some study abroad, a position in a provincial orchestra, and finally a position in one of the London orchestras. 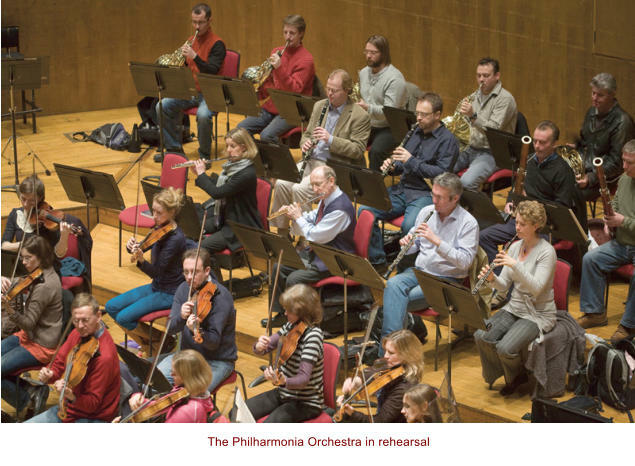 Along the way, the top orchestral musician will have developed a network of other top orchestral musicians who will support one another and recommend one another for work. There is, if you like, a tribe of top players. Members of the tribe might be upset if they fail to get one of the top jobs, but will be less upset if the person who does get the job is one of their mates. The degree of upset grows if a top job goes to someone from outside the tribe, especially if that someone is a quiet, retiring man who does not give the impression of having much self-confidence. The most beautiful girl in the school has chosen to step out with the unassuming swot, and the jocks can’t understand why. Kenneth Smith’s path to the top is as far removed from the common one as it is possible to imagine. He was born in 1946 into a working-class family of modest means in Wolverhampton. (He still speaks with the remnants of a Black Country accent.) His father was a toolroom engineer in a local factory and a Methodist lay preacher. Ken attended a local secondary modern school (within sniffing distance of Wolverhampton’s brewery, he remembers), left at the age of fifteen and, to his father’s great pride, took up an apprenticeship as an engineering draughtsman in another local factory. How he got from there to the first flute’s chair in one of the world’s leading orchestras is a remarkable tale. Ken’s parents sang in local choirs and played the piano, but there had been little music at Ken’s school. There was an orchestra of sorts, but it lacked a flute. The school’s music teacher, a Mr. Rhodes, recognised Ken’s recorder-playing ability and bought an old wooden flute from the retiring flute player in the Grand Theatre in Wolverhampton. It is a hackneyed phrase now, but in the early 1960s the music teacher’s comment on handing over the flute stuck in Ken’s mind: ‘This is the first day of the rest of your life’. It has certainly turned out that way. However much enjoyment he may have had playing the flute in his teens, Ken followed the career path of many of his school colleagues and, armed with six O Levels, went to work in engineering, which he soon realised he did not enjoy. His apprenticeship as a draughtsman required him to learn metal­working techniques. As part of his training he had to make a set of engineering layout tools—squares, calipers, dividers, scribing blocks and the like—which he still owns. (The training was not easy. His first task was to make a perfect cube using only files and other hand tools. 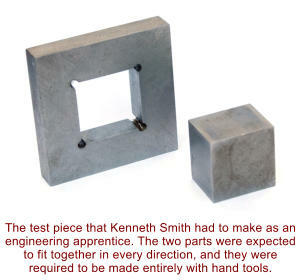 First he had to make a perfectly square hole in a piece of steel, then make a cube that would be an accurate push fit in the hole whichever direction the cube was inserted. ‘I was ever so pleased to get off that job,’ he remembers.) He did make his job a bit more bearable by listening to music on a radio while he worked (often causing him to make mistakes), but for a boy in his mid teens the high point of every day was the arrival of the tea lady, a beauteous young lass. ‘Everything was fine with the chemistry of the body,’ Ken remembers, ‘until she arrived. Then the rest of the day was a write-off!’ (An aside: while I was chatting to Ken at the Royal Festival Hall, Carla Rees Dawson arrived to take his picture. She had trouble getting him to smile. ‘Think of the tea lady,’ I called out, provoking a beam on his face that lit up the Thames. That must have been some tea lady.) Throughout his apprenticeship he continued to play the flute. He travelled to the Midland Institute in Birmingham to have lessons with Delia Ruhm. The word keen is inadequate to describe his attitude—he once turned up for his lesson an hour early. ‘I wanted to play there and then,’ he says. When Delia Ruhm left to have a baby, Ken had lessons with Michael Hirst, then the piccolo player in the City of Birmingham Symphony Orchestra. At that stage Ken decided he really did not want to pursue a career in engineering, but as music was not amongst his collection of O levels he could not get on an academic music course, so he applied for a place at various music colleges. Most refused even to hear him play. Michael Hirst then contacted some people on his behalf, after which Ken was accepted for a place at a teacher training college in Cardiff. When he arrived at the college and played his flute, he was told that he was really in the wrong place and should be over the road in the Cardiff College of Music and Drama. Because he did not have the necessary academic qualifications the college put him on a preliminary year during which he was expected to get certain grades in theory and O Level music. Ken then left engineering (probably breaking his father’s heart, although his parents were supportive throughout) and spent eight months at home learning what he needed to learn. In 1964 he finally entered the college in Cardiff, where he was taught the flute by Hilary Evans, the retired first flute in the BBC Welsh Orches­tra (who played on an 1867 patent flute). Hilary Evans had been replaced by the very young Sebastian Bell, with whom Ken had a few lessons, and he had a few lessons with James Galway, too, when Sadler’s Wells Opera, in which he then played, were in the area on tour. Ken preferred a coloured, French style of playing which was somewhat at odds with Bas Bell’s tastes at the time, so Ken changed teachers to Stanley Gleave, the second flute player in the Welsh Orchestra. Stanley Gleave occasionally sent as a deputy a muscle-bound former circus strongman named Frank Wilson, recently retired from the BBC Welsh orchestra. (Another aside: the climax of Frank Wilson’s circus act had been to lift a member of the audience in a chair with one hand while playing a piccolo solo with the other. They just don’t make orchestral players like that any more.) Gleave and Wilson agreed to coach Ken on orchestral excerpts while Ken travelled to Birmingham once a fortnight to have a lesson with Michael Hirst. (He would see his parents in Wolverhampton on the same trips.) When Ken finished at his college in 1967, he spent a further year’s study at St. Mark’s and St. John’s Teacher Training College where he could get a qualification as a class teacher. (One of his fellow students at this college was Susan Milan.) Michael Hirst figures frequently in Ken’s flute- playing development. ‘When one door closed, he always seemed to appear and open another,’ says Ken. ‘Around this time he arranged for me to have a lesson with Geoffrey Gilbert, which led to two years’ invaluable study with Peter Lloyd, then principal flute of the LSO. During this time I worked quite hard and attended various flute courses. The real treasure was some unforgettable private lessons in Canterbury with the legendary Marcel Moyse.’ In order to qualify as a teacher Ken returned to Wolverhampton and taught as a peripatetic flute teacher for a year. 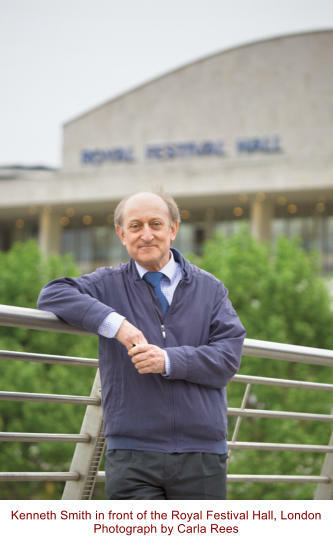 While working as a peripatetic teacher he began to audition for orchestras and got himself a place in the BBC Training Orchestra in Bristol, in which the members of the section took turns playing first, second and piccolo. 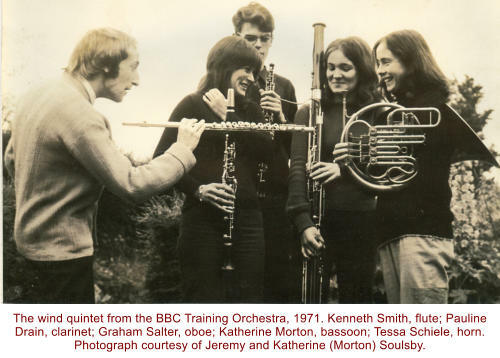 After three years, in January 1973, Ken joined the Bournemouth Symphony Orchestra as second flute to Laurence Beers (another player of the 1867 patent flute). He stayed in the Bournemouth orchestra for ten very happy years. In the early 1980s the Bournemouth orchestra made a two-week tour of Germany and Switzerland with Aurèle Nicolet as the flute soloist. Ken Smith’s life changed. He was sitting on the platform after a rehearsal practising the second flute part of a Dvořák symphony when Nicolet sat down next to him. ‘You know,’ said Nicolet, ‘there’s a first flute job going in the Philharmonia Orchestra. Why don’t you have a go at it?’ No chance, thought Ken, but after every concert Nicolet gave him a lesson, and after every lesson he told him to bring some other piece next time. Wherever they were, Ken would scurry around trying to find copies of the music he had been asked to play, although he already had copies at home. ‘It was the most magical time,’ Ken remembers, ‘having these lessons from him. He had the enthusiasm of a young teacher.’ Nicolet persuaded Ken to audition for the Philharmonia, although Ken thought it was a step too far and had no possibility of getting the job. Lessons with Nicolet were very useful, very detailed and concerned solely with the music—phrasing, breathing, getting the most out of the music, the significance of every note—and not with the technique. That, says Ken, is the problem with a lot of flute teaching today: young players now have staggering technique, but use the music to show off their abilities rather than using their abilities to show off the music. For Nicolet, the music was all, and the lessons he gave Ken, to use another cliché, quite simply changed his life. When it came to the Philharmonia auditions, he got to the first round and thought he might, if he was lucky, get some extra work with the orchestra. In fact, he got through to the next round and then was asked to do a trial with the orchestra, to his complete astonishment. The trial stage lasted fourteen months, with quite a few of Britain’s leading players competing for the job. A week before he was due for his final trial, while playing badminton, Ken snapped an Achilles tendon, was taken to hospital and operated on. He woke from his operation to find he was in plaster up to his hip. This forced him to take a gamble. He did not want to tell the orchestra that he was not going to be available for three months because they would surely have appointed someone else in his place, so he persuaded his doctors to cut his cast at the knee. He had to sign all manner of papers absolving the hospital of responsibility, but the cast was cut and he did his trial, hobbling onto the platform on crutches. The programme at his final trial was Shostakovich’s fifteenth symphony, which starts with about thirty bars of flute solo, and a Mozart flute concerto in which the soloist was James Galway. It was after that concert that he was offered the job. It is unnecessary to ask how pleased he was. I asked Ken if he had been given any feedback about why he was given the job. He remembers one example, from the wonderful second flute player, the venerable Cecil Cox, famed for his wit and for his ability to keep people in their places. ‘Well, dear boy,’ said Cecil Cox, ‘there may have been superior executants of the instrument, but you suited us better.’ In 1983 Ken became a member of the Philharmonia. At the end of a year he was told that he had been made a full member, then told that his probationary period was to be extended—he still feels the pain from that—and finally, some months later, the position was his. At one of the first concerts as a permanent member of the orchestra he played the fourth symphony of Brahms, with its famous flute solo in the last movement. After the concert he asked Cecil Cox what he thought. ‘Well, dear boy’—it was always ‘dear boy’ with Cecil—‘that was a little less provincial than before.’ (And Ken took that as high praise indeed.) I remember when it was announced that the Philharmonia job was his. Some of the unsuccessful applicants for the job, a few of them hot-shot players with egos as big as outdoors, were scornful that a fellow who had spent ten years as second flute in a provincial orchestra should have grabbed this plum position that should, they thought, have come to them. Or if not to them, at least to a member of their tribe, not to this unknown outsider. The beautiful girl had spurned the jocks and had chosen the swot. A quarter of a century on, they are still happy together. Now, after all this time, what are the high points and what are the low points? ‘The high point,’ says Ken, ‘was getting the job’—he maintains a schoolboy-like excitement about that—‘and it has been a continuous thrill to play the glorious flute lines in the orchestra. For me, this is surely the best repertoire for the flute. The low points are not achieving what I try to achieve. Occasionally my playing takes a dip, and when it does, it has to be my fault, not the fault of a reed or the weather or anything else. That’s always troubling, but I do get over it by practising.’ There have been painful personal moments, too, and Ken is a sensitive man. It can never be easy for someone to know that there are players around who will stop at little to take over his job, yet for all his sensitivity he has managed to survive in what is really a cut-throat world. He has done this by playing beautifully—so beautifully that conductors and recording companies love having him in the orchestra. He has devoted all his energies to orchestral playing. Colleagues tell that on Philharmonia tours to beautiful places, when everyone else is sightseeing, Ken is likely to be in his hotel room practising. He lives for his job. He always has, and for those of us who have long admired his contribution to the Philharmonia’s beautiful sound, long may he continue. This article first appeared in the September 2008 edition of Pan (now Flute), the journal of the British Flute Society. If they were so clever, why weren't they rich?